I am a Public Historian at the Mid-Atlantic Regional Center for the Humanities (MARCH) at Rutgers University-Camden. There, I am Co-Editor of The Public Historian (the journal of the National Council on Public History [NCPH]) and NCPH’s Digital Media Editor for its blog, History@Work. I also direct MARCH’s Continuing Education Program in Historic Preservation. I am committed to helping everyone interested in history link history practice, outreach, and learning in inclusive and accessible settings. I earned my PhD from the History of American Civilization program in the Department of History at the University of Delaware. My book project, tentatively titled “Confined to Crutches”: The Material Culture of Physical Disability in Early America, and complementary exhibition, are about material culture (objects ranging from crutches and artificial limbs to adult cradles and easy chairs) and physical disability in early America from 1700-1840. I hold an M.A. from the Winterthur Program in American Material Culture. I lecture and lead workshops regularly about disability history, material culture, and museum practice. I serve on the board of the Disability History Association and as a member of the Scholarship Advisory Committee (Publications & Programs), Newport Historical Society, Newport, RI. The photo at the top of the site was taken at the Upper Bay Museum in North East, Maryland, during a two-week museum project I took part in with the Museum Studies program at the University of Delaware. 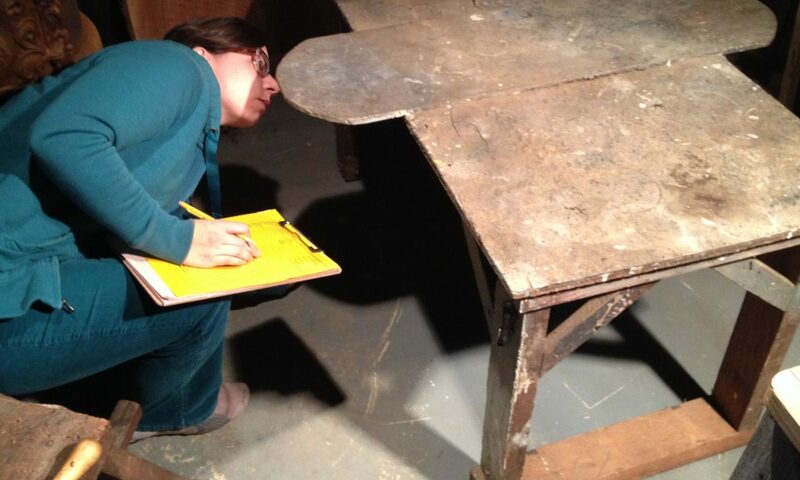 In the photo, I am cataloguing a twentieth-century worktable used by a decoy carver from the Upper Chesapeake.